Deepak Chopra is the Founder of the Chopra Foundation, and Co-founder and Chairman of the Chopra Center for Wellbeing in Carlsbad, California. He is a columnist for the San Francisco Chronicle and Washington Post On Faith and contributes regularly to Oprah.com, Intent.com, and Huffington Post. Chopra is known as a prolific author of more than seventy-five books with twenty one New York Times best sellers in both fiction and nonfiction. A global force in the field of human empowerment, Dr. Chopra’s books have been published in more than thirty five languages. His New York Times bestseller “Peace Is the Way ” received the Religion and Spirituality Quill Award in 2005, and “The Book of Secrets: Unlocking the Hidden Dimensions of Your Life” was awarded the Grand Prize in the 2005 Nautilus Awards. His latest New York Times bestsellers include “What Are You Hungry For: The Chopra Solution to Permanent Weight Loss, Well-Being, and Lightness of the Soul”, “Super Brain: Unleashing the Explosive Power of your Mind to maximize Health, Happiness, and Spiritual Well Being”, “War of the Worldviews”, “Reinventing the Body, Resurrecting the Soul”, and “Spiritual Solutions – Answers To Life’s Greatest Problems” His book , The Soul of Leadership, was mentioned as one of five best business books to read for your career FINS – Wall Street Journal. 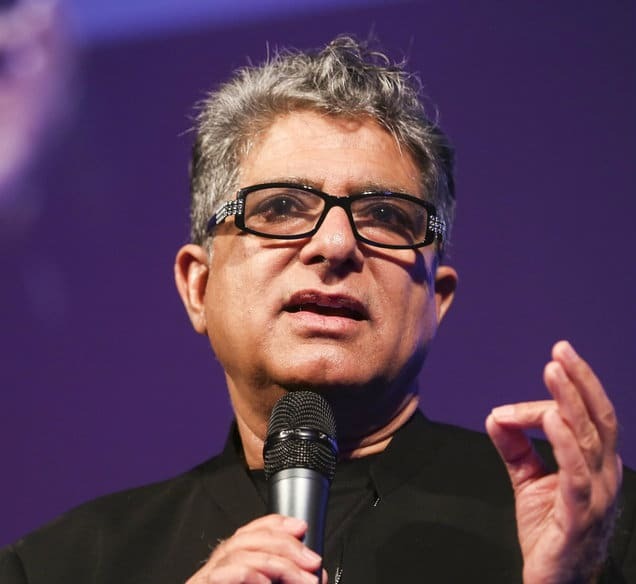 Deepak Chopra’s popularity as an international presenter and keynote speaker is exemplified in an impressive list of honorariums. Chopra is the recipient of the 2010 GOI Peace Award, 2010, Starlite Humanitarian Award, 2010 Art for Life Honoree, 2009 Oceana Partners Award, 2006 Ellis Island Medal of Honor presented by the National Ethnic Coalition of Organizations Foundation, and 2006 Trailblazer Award by the Scripps Center for Integrative Medicine, 2002 Einstein Humanitarian Award through Albert Einstein College of Medicine in collaboration with the American Journal of Psychotherapy. He participates annually as a lecturer at the Update in Internal Medicine event sponsored by Harvard Medical School, Department of Continuing Education and the Department of Medicine, Beth Israel Deaconess Medical Center since 1997. Dr. Chopra is a fellow of the American College of Physicians, a member of the American Association of Clinical Endocrinologists, and an Adjunct Professor of Executive Programs at the Kellogg School of Management at Northwestern University.